Small Hydropower Market size on installation base was over 110 GW in 2015.The industry expects gains at over 2.5% CAGR up to 2024. Global domestic electricity consumption increased by 1.2% from 2013 and estimated at more than 20,300 Twh in 2014. Asia electricity consumption was dominant and comprised over 40% in 2014. North America, noted as the second largest consumer with consumption at over 4,365 Twh in the same year. 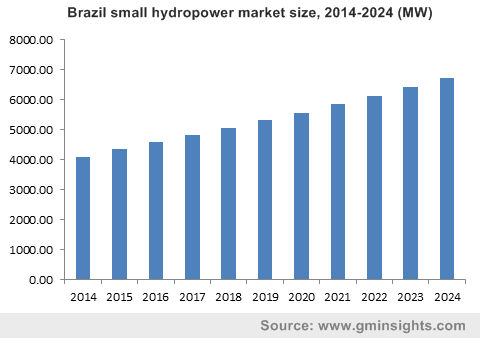 Rapid industrialization and increasing population are expected driving factors to leverage small hydropower (SHP) market size growth. Increasing GHG emission owing to rising power consumption has fueled FERC & UNIDO to adopt certain measures pertaining to renewable energy. Growing environmental consciousness and reducing dependency on conventional resources are projected to foster global small hydropower market size growth. Monetary concessions and credits are given to industries for producing and consuming sustainable resources including wind, solar, and hydro. Hydropower accounted for 16.60% of the global renewable electricity consumption in 2014. Approximately 37 GW capacities were added in 2014, increasing total capacity by 3.6% approximately. China, Brazil, U.S., Canada, Russia, India were the major industry contributors. China was the major contributor by accounting more than 25% of the global hydropower capacity in 2014. Abundant hydro potential location accompanied by skilled labor availability may positively drive small hydropower market growth. Rising industrialization in BRICS nations, authorities are focusing on rural and remote areas to supply electricity. Inability to transit energy in remote & rural areas owing to grid unavailability should increase small hydropower demand. Small hydropower plant is specifically designed to serve remote areas. These plants can be grid connected and off grid; off grid is mainly suitable for where grid connectivity is not available. Energy policies are implemented by governments pertaining to total electricity generation capital cost, maintaining safety, communities resettling and manpower availability to build and operate the plants. SHPPs are being designed to reduce high capital costs and to minimize environmental impact on the local community. SHPP is often built using existing dams as these plants does not require huge infrastructure and facility, which is highly relevant for countries with less capital. These plants are also constructed within the river flow, termed as run of river; ideal for areas with no electric infrastructure. Transformers, generators, turbines, and reservoirs are the essentials to build SHPPs. Abandoned hydro sites utilization is another lucrative factor to positively influence small hydropower market growth. Many old sites that need refurbishment but constraint by budgets can be operated as SHPPs. Tajikistan is eighth richest nation in terms of hydropower resources globally. However, due to lack of capital and investment, this resource is underutilized with electricity supplies and still failing to meet country energy needs. Tajikistan government is now working to solve power problems by building mini plants. The project is focused to meet overall energy requirement by building approximately 170 mini plants in remote & rural areas. The technical difficulties to upgrade existing power transmission lines in rural areas may hinder the small hydropower market growth. These lines were initially designed for centralized electricity generation model; not with the intentions to compatible with large volumes generated locally. Seasonal diversification in stream flow results in variation and disturbance in energy supply. Careful planning is required to ensure sufficient energy production throughout the year, particularly in dry season and areas. Additional logistics & transportation cost due to remote location may affect the small hydropower market price trend. APAC dominated the regional industry with more than 80 GW installed capacity in 2014. China, India, and Japan small hydropower market size were the major contributors. Rising need to supply electricity in remote areas accompanied by growing environmental consciousness are expected trend to fuel regional demand. North America, with dominant Canada and U.S. small hydropower market size, is set to grow at more than 2.5% CAGR up to 2024. Policies by FERC in order to promote renewable energy coupled with need to provide energy in rural areas are promising factors to foster industry growth. Central & South America is set to grow at over 4.5% CAGR up to 2024. Huge hydro potential sites and untapped areas should propel regional demand. Italy dominated Europe small hydropower market assessment with total installation of over 3.1 GW in 2014. Resource availability and trend to adopt renewable technologies were the major influencing factors to stimulate market growth. Global small hydropower market share is competitive and mainly influenced by government regulations & energy targets. Key industry participants include Voith, Andritz Hydro and GE, Siemens. Other prominent companies include Agder Energi, 24H - Hydro Power, Lanco, Derwent, StatKraft, RusHydro, and Fortum Oyj. Focus to refurbish and replace existing plants is among the key strategy to increase company operational activities. It is a method to generate electricity that uses moving water to produce electricity. SHP is primarily used in isolated regions. These plants are installed in streams, small river or in the existing water supply network. SHPP can be installed with negligible environmental impact on ecosystems. Due to its low investment costs, versatility, and renewable nature, it is a suitable option to generate sustainable as well as inexpensive energy in developing and rural areas. Hydropower plants are categorized as per their energy production capacity, denominated in megawatts. SHP production is bifurcated into four sizes, pico (<5 kw), micro (5-100 kw), mini (100 kw-1 mw), and small (1-10 MW). However, categorization differs from country to country as there is no standard consensus among regions. In European Union, Portugal, Belgium, Ireland, Spain, and Greece accept 10 MW as upper limit for SHP installed capacity, while in other countries 3 to 1.5 MW is the maximum capacity. Hydropower generation relies on water flow and head to generate energy, SHPP can be installed in any system where these factors are available. It includes streams, rivers, water network where pipes supply water flow to head. Small hydropower fit into run of river systems and in existing water infrastructure. Majority of small hydropower plants are run of river schemes. Electricity is produced when sufficient water is present in stream or river. When electricity is produced, the power house transfers the electricity to a transformer which transmits to the grid substation or to the destined village. Once electricity is generated, water flow returns back to the river. Due to this factor, small hydropower plants are recognized as a non-polluting and renewable energy source. When the flow reduces and reached below design flow value, the production stops. Infrastructure is already built, which reduces the investment cost by around 50%. No land acquisition is required. The plant setup will have minimal environmental impacts, and guaranteed discharge throughout the year is available. The produced electricity is also used in water supply system, with surplus power traded to the government.